It's been two weeks since the release of Orphea which means her price has been reduced to 10K. 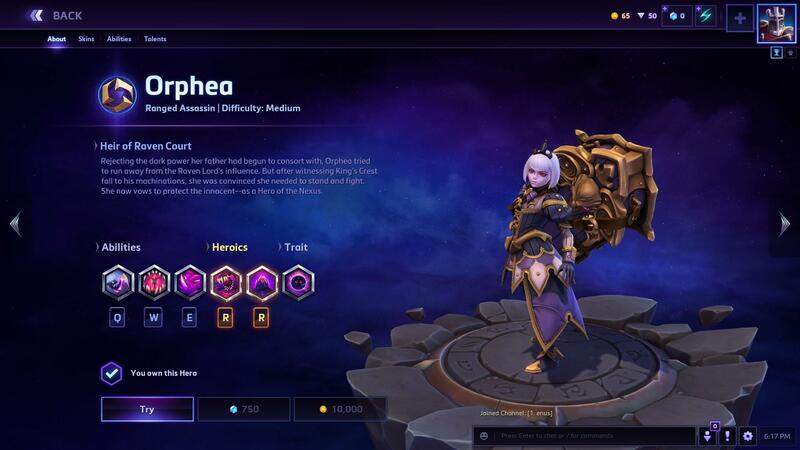 Orphea is the first Nexus-born Hero that was brought to the Nexus. She's available to all BlizzCon attendees and Virtual Ticket holders as a gift, free of charge. The Virtual Ticket is on sale even after BlizzCon 2018 and the WoW Classic Demo for $49.99 // 39.99 EUR, so if you care about this year's in-game rewards, you can still buy it. Don't forget to check out our Orphea build guide and share your favorite builds with friends using the talent calculator. Indeed. I bought her immidiately when I saw she was on 10k and I don't think I am going to regret it. Her kit feels great. It also really emphasizes something that I need to practice - weaving in AAs in between abilities. I am awful at it, but Orphea emphasizes how bad I am actually at doing that and this is a big point for mechanical improvement for me that will serve me well on not just Orphea, but many other heroes as well.